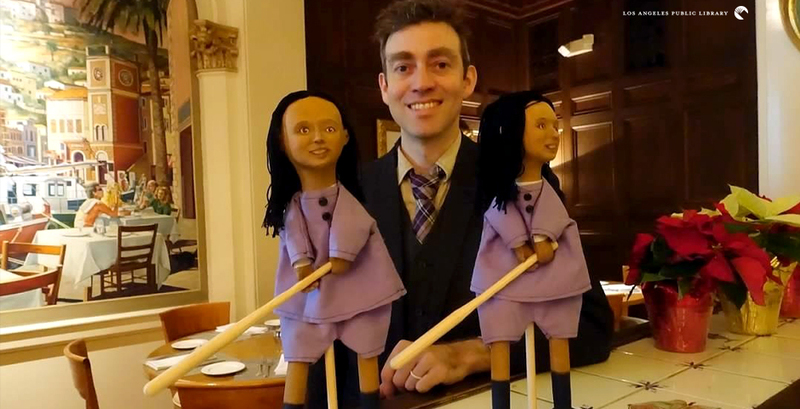 Puppeteer Jesse Kingsley with puppets for the 2018 FOCAL Award-winning book, Uma Krishnaswami’s Step Up to the Plate, Maria Singh. One puppet was given to the author, and the other to the Children’s Literature Department which is on display through January. The Children’s Literature Department of Los Angeles Central Library is so vast and awe-inspiring, one of its most fascinating offerings could be easily overlooked. Displayed each year for a limited time are professionally hand-made puppets depicting the primary character from each year’s FOCAL Award-winning titles. The awards, given for the best children’s book with California content, are chosen by FOCAL (Friends of Children and Literature), a support group of the Central Library Children's Literature Department. Every year two identical puppets are made. One is given to the award-winning author, and the Children’s Literature Department receives the second puppet. The puppets go on display around the time of the awards ceremony usually held in early December and are on view usually through January of the following year. They are then removed from display and are kept in protective storage. Ms. Day said it was FOCAL member Sandy Schuckett who suggested that the annual FOCAL award be a puppet and the main character in the prize-winning book. “I connected with Carol the next day and we were off and running,” she said. Mrs. Onofrio hand-delivered each year’s puppet in its own special basket to the awards ceremony each year, from 1980 to 2013. She died in 2014. Carol Hodges Onofrio attended Chouinard Art Institute and then UCLA where she earned a BA in Art. She was a professional window dresser and designer for major department stores, worked in the wardrobe departments for NBC, and designed costumes for the children’s theater company, Nine O’Clock Players, produced by the Assistance League of Southern California. The FOCAL Award was first given in 1980, to Leo Politi, Los Angeles author and illustrator, for Pedro, the Angel of Olvera Street; His book is displayed beside Onofrio’s puppet of Pedro in the first of the display cases. Pedro was the first puppet created by Carol Onofrio for the book award series sponsored by FOCAL. It honors Pedro, the Angel of Olvera Street, written and illustrated by Leo Politi. The book was the 1946 Caldecott Honor book and is still in print. The last puppet created by Onofrio for FOCAL was for the winning book, One Crazy Summer by Rita Garcia-Williams feature the character, Delphine. The book is part of a trilogy about the Gaither sisters and also includes Gone Crazy in Alabama and P.S. Be Eleven. Since 2014, local puppeteer and artist Jesse Kingsley has created the FOCAL puppets in collaboration with this wife Moira Lael MacDonald, an instructor in theater arts and costume design. Jesse has been sculpting and creating since he was a young child and has worked with The Mystery Puppet Theater. The first puppet created for FOCAL by Jesse Kingsley was of Katherine, the main character in The Tree Lady by H. Joseph Hopkins. The 2018 FOCAL prize was awarded on December 8 to Uma Krishnaswami for Step Up to the Plate, Maria Singh. Set during World War II, it is the story of a nine-year-old girl who yearns to play baseball on a new team in an All-American Girls’ League. She challenges prejudice and discriminatory laws while her father, originally from India, and her mother, who was born in Mexico, struggle to keep their farm in Yuba City, California. This book, like all the prize winners, are available from the library. Want to See the Puppets? Special thanks to Madeleine Bryant, Renny Day, Diana Rosen, and Neale Stokes.